It’s already the middle of February. Where did the winter go? To say it’s been a strange winter is an understatement. Two big snowstorms (or events as they are called now) in the fall months, and some cold but not a lot and the bulk of winter is behind us. Oh sure, we may get some cold and perhaps some snow but with the days getting longer, spring is closer than we think. The woodpile has shrunk considerably, which is a sure sign of winter’s waning days. Fine by me as spring is my favorite time of year. It’s 32.7˚F outside as I write this and it’s 75˚F in the greenhouse. We’ve just recently had the grow lights installed to mimic summer day length. I’ll tell you, walking in at night to turn the lights off and one would think they’re some place tropical. Well, not really tropical, but it is great to be in where it’s warm and well lit with crops being grown. It’ll be months before we see this outside. This last paragraph brings me to my subject for this week -- the home greenhouse. I always wanted my own greenhouse. I like growing crops in a greenhouse and we wanted to grow seedlings for our own use so when one came up for sale locally, we bought it. It was a New England series built for the snow loads we often get here. Dimensions were 21 feet wide and 32 feet long – perfect size. It came with a propane furnace with controls, a 36-inch exhaust fan, a new roll of plastic, baseboards and wood framed end walls. Buying it was the easy part! First thing we had to do was move it. Taking it apart and moving it 15 miles took me a weekend. It was easy enough. Turn the nuts to tighten and they snap off easily; I’d planned on replacing them anyways. I didn’t worry about taking the plastic off as it was 8 years old and I had a brand new roll to put on. The ends came off and were loaded into my truck in one piece; well, you get the idea: taking one down is the easy part. Once I got all the parts and pieces home, it was time to put it back together. First of all I wanted to make a few minor changes in the structure; namely adding roll up sides, vents that would close automatically and additional purlins or crop support piping. At the time water pipe was cheap so I added the roll up sides, which also meant I needed to add a hip board. I extended the baseboard from eight inches tall to sixteen inches tall. The structure itself went up fairly quickly, especially since I did most of it myself. New plastic was installed, and the new aluminum vents were put in the end opposite the fan end. The propane furnace was installed (a word of caution here – heating any greenhouse large or small is an expensive proposition) and all was good. Now what to raise in it and how? 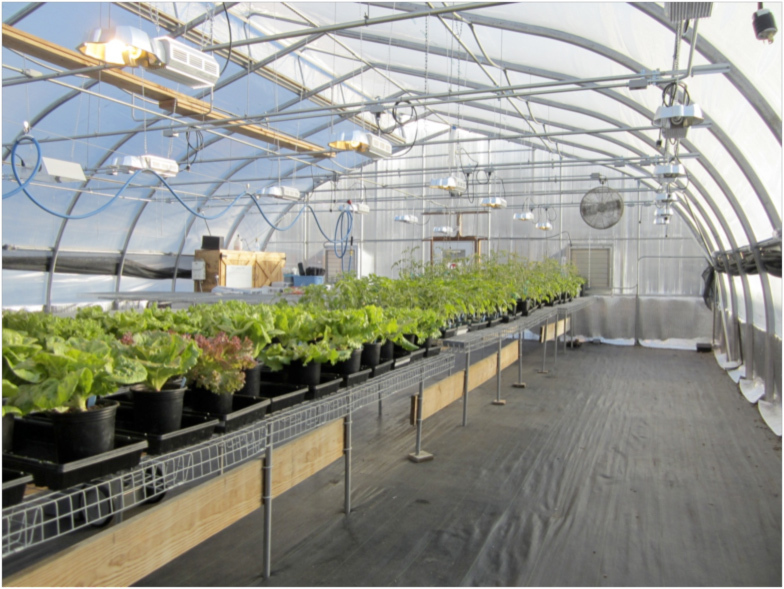 Like most greenhouses around, we built benches and grew seedlings. The first couple of years we had 500 or so 6 packs of various seedlings to sell and tried retail. There are a couple of drawbacks with selling retail if you work full time plus. Being around all the time and being cordial all the time. Everyone needs some space and that’s what my home is for; space to do and be what I want to be. That’s pretty hard if you have people showing up all days and times, poking through everything, criticizing and then not buying anything. Anyways, to make a long story even longer, we decided retail wasn’t for us. And growing seedlings wasn’t for us either. So we decided to take out the benches and grow vegetables in the greenhouse instead. We built raised beds; five in all, two 2-foot beds and three 3-foot beds. This configuration allowed us room to work around the beds easily but also made good use of the room we had. The beds were 12 inches tall and we filled them with topsoil with a liberal amount of compost mixed in. We also had hanging baskets full of flowers and cucumbers. It turned into kind of a cool project. We had an area for mixing flats and for planting and transplanting complete with a sink, lawn chairs and a coffee table. 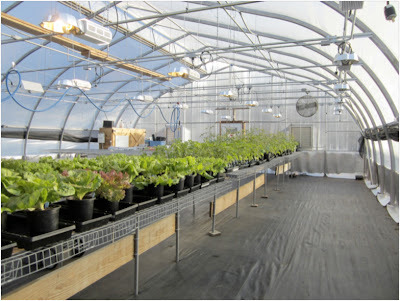 A greenhouse in the winter, even without supplemental heat, can easily climb into the nineties during a sunny afternoon, so what better place to hang out on a cold winter day? During the fall and winter we laid plywood over the beds and used it for storage during the cold winter months. In the 2-foot beds we raised tomatoes, summer squash and cucumbers. The 3-foot beds were primarily salad greens with a few fun projects thrown in like super early potatoes. We had a pretty good setup but like all things we decided to pare down what we grew as we weren’t into selling it and we raised far more than two people could possibly consume. We gave away much produce, and we had a good time raising all these crops but it too soon became a high maintenance project. Each year we grew less and less until we stopped growing altogether. So, once we decided not to grow crops or seedlings in there what do we want to do with it? I toyed with selling it, but didn’t really want to. We took out the raised beds and put landscape fabric down to keep the weeds from overtaking. We still used it for curing onions and could put it back into growing crops if we wanted to. Today we use it for storage for our lawn furniture, wood splitter, lawnmower and my boat. There’s also a cord of wood for the kitchen cook stove, scrap wood for the fire pit and my four wheeler and trailer. The issue of being so hot in the greenhouse; too hot to store equipment in, was alleviated by hanging the shade cloth from the frame on the inside of the greenhouse. It now remains cool and dry in there. So, basically, it’s a storage area now. Looking over the contents of the greenhouse last weekend, I think if I cleaned it out I would make something else out of it now. Most of what’s in there can be stored somewhere else; I only use the greenhouse for storage because it’s already there. So, what can I do with this structure next? Yep, here it comes: Peafowl housing! First I’ll clean it out and then I’ll run some four foot wire around the bottom of the greenhouse between the baseboard and the hip board. That’ll keep the critters out and the peafowl in. I’ll take the shade cloth down and put it on the outside once the weather starts to warm up. I think I’ll make a spot in one corner that she can have her nest and sit on her eggs, and a couple of roosts; they like to sit on them to preen and talk. The greenhouse should make a really good pen as it’s over 650 square feet and 10 feet tall at the peak. Currently their pen is 10 feet tall but only 140 square feet. I’ll pull out the landscape fabric and replace it with clean straw. And maybe just for kicks I’ll toss a few guinea hens in with them! The greenhouse proved to be an interesting project. It all started with the research of what we wanted and what was available, buying, moving, and modifying it. Raising crops and seedlings and finally using it for something completely different than what it was designed for; there are endless possibilities of what to do with a greenhouse. If you have the want and the opportunity to get a hold of one, do so and you’ll find lots of possibilities too. I just put up my own Mini Green House, gonna use it for seed starting and such. One Day I'll have a greenhouse that big...I hope lol.